The European Jobs Monitor uses a jobs-based approach to analysing structural shifts in employment in Europe. The key methodological innovation of such a jobs-based approach is to observe employment developments at the level of the job (understood as a given occupation in a given sector) rather than at the level of the individual worker, as is the more customary approach in analysis of labour market developments. 1. Using the standard international classifications of occupation (ISCO-08) and sector (NACE Rev 2.0) at two-digit level, a matrix of jobs is created in each country. Each job is an occupation in a sector. In total, there are 43 two-digit occupations and 88 two-digit sectors, which generates 3,784 job cells. In practice, many of the theoretical job cells do not contain employment; there are unlikely to be many skilled agricultural workers in financial services, for example. The country total of job cells with employment varies between around 400 and just over 2,000 and is largely determined by country size and labour force survey sample size. The bigger the workforce, the greater is the variety of possible job combinations that can be identified using LFS data. 2. The jobs in each country are ranked, based on some ranking criterion, mainly the mean hourly wage. The job-wage rankings for each country used in this report are based on combining data from the EU-LFS annual data files for 2011–2014 and aggregated data from the Structure of Earning Survey (SES) for 2010. These sources allowed the creation of country job-wage rankings for 28 Member States. 3. Jobs were allocated to quintiles in each country based on the job-wage ranking for that country. The best-paid jobs are assigned to quintile 5, the lowest-paid to quintile 1. Each quintile in each country should represent as close as possible to 20% of employment in the starting period, ie jobs are assigned to quintiles based on their employment weights. Hereafter, the job-to-quintile assignments remain fixed for each country so that in all of the charts that follow in this report a given quintile in a given country (however decomposed) always refers to employment data in a specific group of jobs exclusive to that quintile. For presentation purposes, the focus then is shifted the change in the stock of employment at quintile level during a given period in each country, eg. 2011 Q2–2016 Q2. 4. Net employment change between starting and concluding periods (in persons employed) for each quintile in each country is summed to establish whether net job growth has been concentrated in the top, middle or bottom of the employment structure. Except where otherwise indicated, all charts in the report describe net employment change by quintile for the indicated country or for the EU as a whole. 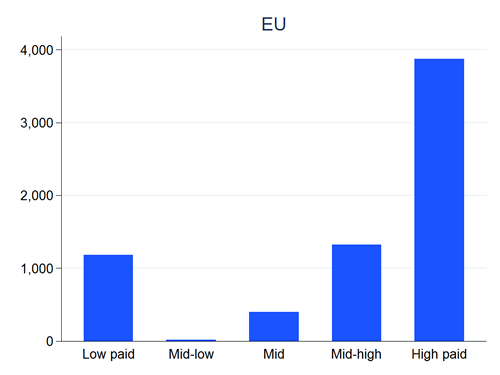 The EU aggregate charts are based on applying a common EU job-wage ranking (based on the weighted average of the standardised national job-wage rankings) . 5. The resulting quintile charts give a simple, graphical representation of the extent of employment change in a given period, as well as an indication of how that change has been distributed across jobs of different pay. A similar classification of jobs can be done using job-holders’ skills or a broad-based, multidimensional indicator of job quality as a ranking criterion. The quintile chart below, for example, illustrates employment change for the EU28 during 2011 Q2–2016 Q2. 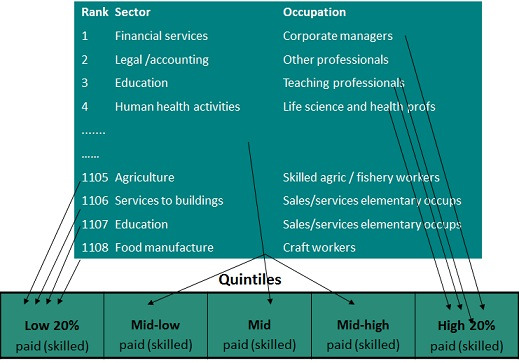 The figure should be read from the leftmost bar cluster (quintile 1, representing the lowest-paid jobs) to the rightmost cluster (quintile 5, representing highest-paid jobs). Net employment change is represented on the vertical axis, generally in thousands but sometimes in annual percentage change. The dominant feature of the chart is the addition of around 3.9 million well-paid jobs (top quintile) over the period. 6. This method also offers further possibilities of breaking down these net employment changes by such categories as gender, employment or professional status, and working time category: full-time or part-time. For a more extensive description of the data-processing involved, please refer to Annex 1 of the report. Further background documentation includes Stehrer and Ward (2008), as well as extensive material in the annexes of previous European Jobs Monitor (EJM) annual reports where the same jobs approach was used.